These are the products that are in my skincare routine but I don't tend to use everyday :) They consist of spot treatment, face masks, serums, toner, and exfoliator. 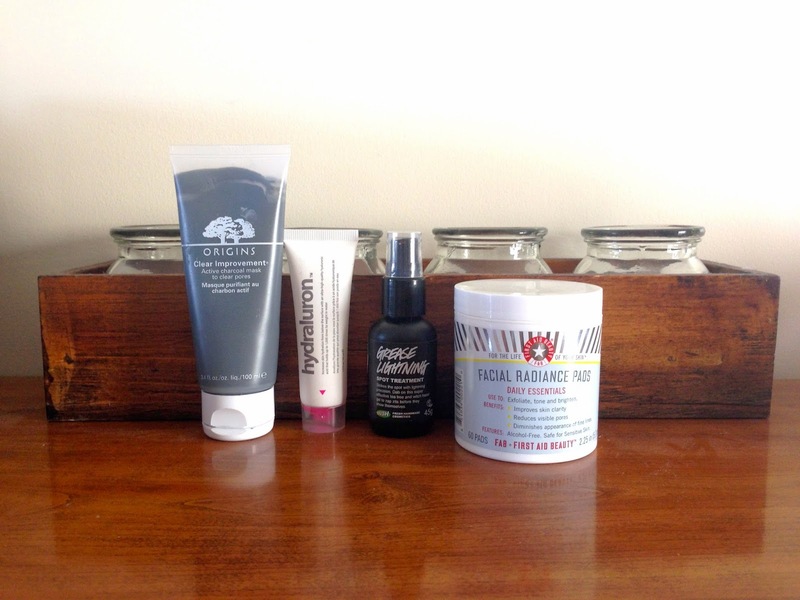 Most of these products I don't use everyday as they are not intended for every day use. Most I use around one to two times a week, and others only when I have specific skin problems. 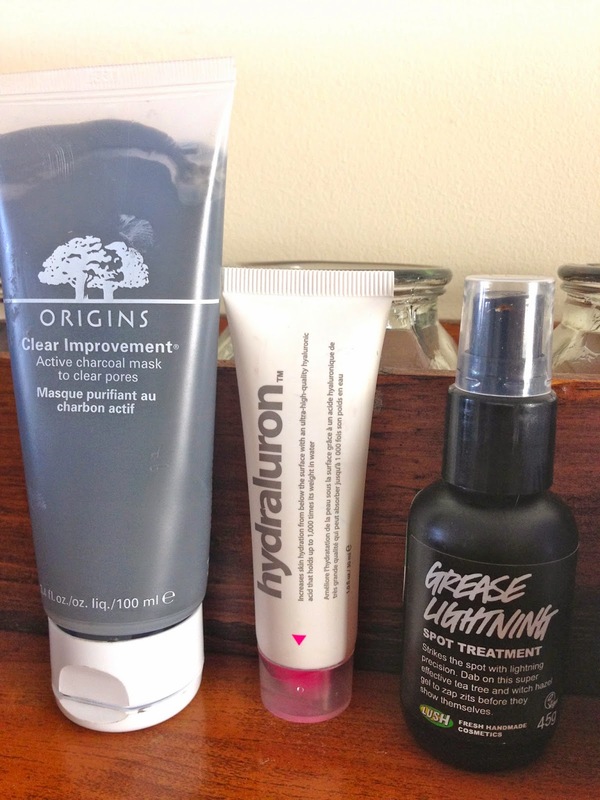 Starting from the left you can see the Origins Clear Improvement mask. I use this mask once a week usually on a sunday to give my skin a deep cleansing, and to get rid off all the oil and dirt out of my pores. This mask is great to use to dry out pimples, and it helps them with the healing process. Your skin feels amazing after wiping it off. There is also a range of other masks I use to mix things up a bit :) You can find these on my earlier post about my current favourite masks. Sometimes I get dry patches of skin on my face they are usually around the base of my nose or a random patch on my cheek. When these pop up I like to to place some Hydraluron on them. Hydraluron is a hydrating serum that has Hyaluronic acid to restore your skins optimal hydration levels, the Hyaluronic acid can hold up to 1000 times it's weight in water. I swear every time its that time of the month, a little nasty pimple decides it wants to pop up somewhere on my face. All I can say is thank goodness for concealer! But to treat these nasties and try get rid of them as quick as possible, I use my Lush Grease Lightening Spot Treatment. It is a face gel infused with Tee tree, rosemary, thyme, and aloe. That have antibacterial properties, and help dry out the pimple, and start that shrinking process. It really does help! Even it you are wanting to reducing the steeling for better makeup application, it works that quick! First Aid Beauty Daily Facial Radiance Pads, tone, exfoliate, and brighten the skin all in one. 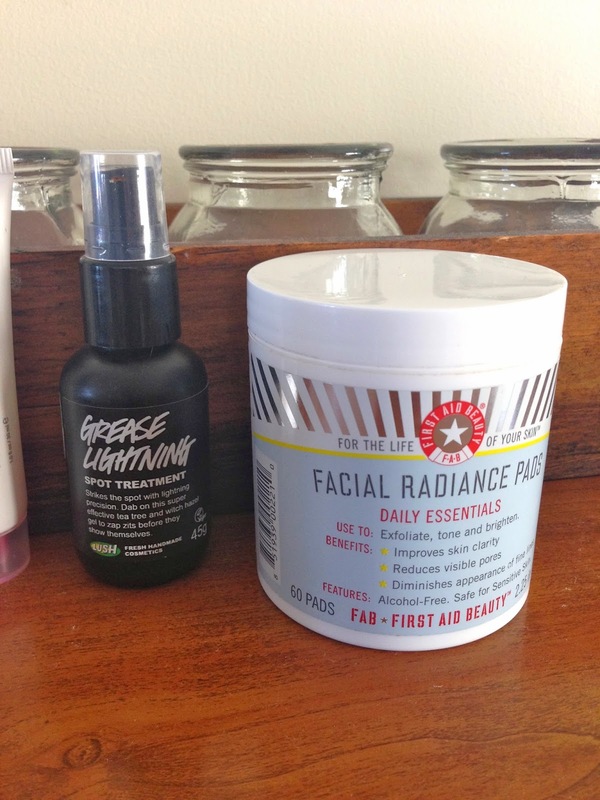 They are safe and gentle to use for everyday use, but I only tend to use them about twice a week, as I don't want to over do my skincare routine by putting way to many products on my skin. My dermatologist said I was using way to many products for my skin type, which was interesting to find out. I like to make sure I exfoliate my skin at least once a week to refresh the skins surface, and get rid off all the dead skin cells. 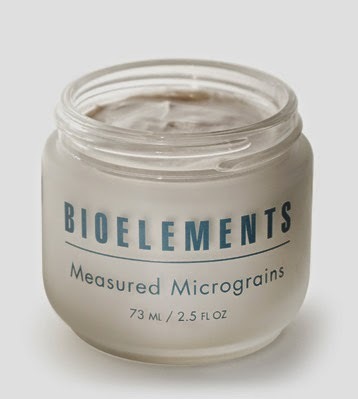 I use the Bioelements Measured Mircograins. Sorry I didn't photograph this one for you guys, it actually recently shattered in my shower and I have it in a different plastic! container. Glass in the shower is not a good idea. But the product itself works nicely. You can also wear it as a mask. It claims to refines pores, brighten skin, and minimize fine lines. Once again I'm trying to prevent premature aging.